Quest Waterfront the best value accommodation in Hobart. 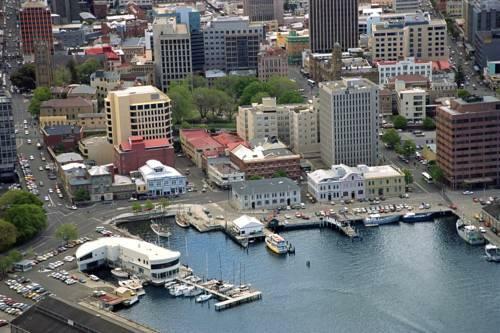 Located in Historic Sullivan's Cove, Quest Waterfront offers 4 star hotel and apartments accommodation just a stone's throw from Hobart's thriving waterfront and a short stroll from the Hobart CBD. Ideal for either leisure or business travellers, the Quest Waterfront Apartments Hotel is only meters from numerous cafe's, restaurants, bars, shops and the renowned Salamanca Place and it's famous market. The Quest Waterfront Apartments is close to everything that Hobart has to offer and features numerous guests facilities including business centre, child minding, direct internet access, disabled facilities, faxing facilities, guest laundry, lift, secretarial services, tour desk, airport shuttle, security, babysitting service and daily housekeeping. It is bursting with Restaurants and cosy little bars such as the Bird Cage Bar with nightly live entertainment, and the Sports Bar with its huge screen to keep up to date with the latest sporting events! Make the most of our fabulous location and sample some of our Fresh Tasmanian Produce available at Salamanca Markets every Saturday. Quest Waterfront is the ideal for the corporate guest or as a base from which to explore Hobart and Southern Tasmania on your next romantic getaway or family holiday. . Nearby Attractions : Ideally located close to the numerous galleries, shops, cafes, bars and restaurants that abound in Salamanca Place and Sullivans Cove. Equally close to Hobart's bustling CBD and its major shopping areas along Elizabeth St Mall, Liverpool St and our delightful arcades: Centrepoint, Cat & Fiddle Arcade, and the Bank Arcade. Take a wander around the historic suburb of Battery Point, only metres to the museums, art gallery, the Federation Concert Hall, home to the TSO and similarly close to the convention centre. For an evening treat, only a short drive away is the Wrest Point Casino, take time out and relax at Savoy Baths, Hobart's only comprehensive therapeutic Baths with heated salt pool, spas, steam room, sauna, massage and treatment facilities. Why not take a day to enjoy the Peppermint Bay Cruise, the 4 hour cruise along the Derwnt River and d'Entrecasteax Channel will take you down to the picturesqe Peppermint bay where you spend 1 hour ashore to enjoy the amazing views of bruny island, dine in their world class restaurant or exploring the grounds and art gallery. 1 Bedroom Spa Suite : Sleeps up to 5 guests on 1 King & 2 Single Beds, Or 4 Single Beds + Rollaway Extra. Queen Spa Hotel Room : Sleeps up to 2 guests on 1 Queen Bed. Queen Spa Motel Room : Sleeps up to 2 guests on 1 Queen Bed. Spa Studio Apartment : Sleeps up to 4 guests on 1 King Bed, Or 1 Queen Bed + 2 Rollaway Extra. Studio Apartment : Sleeps up to 3 guests on 1 Queen & 1 Single Beds.